There’s nothing like having a fun evening with friends or family over with a dinner party. Traditionally, dinner parties is a way to help get connections and establish stronger ties in society, but at present, dinner parties are made just to keep in touch and share pleasant times with people you know and love. 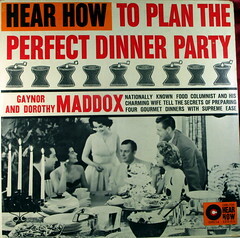 And to pull it off, you need to know the basics when it comes to holding a dinner party of your own. Remember that this is the most essential part of your dinner party preparations. Here you determine what the theme of the party is, who and how many guests to invite, the menu, the decorations and the entertainment. It is suggested that you plan your party 2-3 weeks before to give you and your guests plenty of time to prepare. This also allows your guests to send a reply in case they can’t make it to the party. Invitations are important as they allow you to plan for the dinner party more effectively. You can do invitations over the phone, or you can send invitation cards online or through mail. Phone invites have the advantage of asking your guests for possible food allergies and menu preferences, these are valuable information when you’re in the food preparation stage. Card invites are great if you want to be a bit more formal and creative in your invitations. Planning a dinner party also includes the table design, the utensils, the food and entertainment. You should take inventory of what you have in your home, and also the things that you need to get to pull the party off. Take note of your fine china, your tableware, and the tables and chairs that you’d need. Budget also enters here. No need to get too extravagant in the food and decors for dinner parties for close friends and family. But if you’re dinner party is meant to impress, then you better have all the things that you need to present an entertaining evening for your dinner guests. Planning a dinner party requires a lot of planning, but if you stick to the plan and pull it off, the rewards are great. Aside from being establishing yourself as a good host, you also ensure that your guests enjoyed fine food, excellent surroundings, and an overall great evening. Organize Luau Party – Organizing special celebrations or events. Bachelor’s Party Planning – Planning and preparing for an event. Organizing Halloween Party – Tips on planning and organizing parties. Organizing Tea Party – Tips on planning and organizing parties. Organizing a dinner party needs an ample time for the host to think creatively and logically the kind of ambiance or atmosphere they want to project on that particular night. Visitors must feel the rhythm and mood the host had intended them to feel by setting up the whole venue depending on its concept, having a music that will stir up their emotions, a program that will motivate them to participate. Of course dinner activity shall be fun if all guests enjoys the evening with casual conversations. Aside from the tips stated above, it is also important to keep in mind what your guests might want. Would they want traditional dinner party? Or would they like it to be done in the backyard, which in this case would probably become a barbecue/dinner party. But most important of all, whether inside or outside the house, the guests must feel welcome and relaxed. The right music could set the tone, plus paired with creative decorations and simple yet extravagant looking china and table cloths would give off the feeling of eating inside a restaurant. Plus, you must also take into consideration that you are planning a dinner party, so guests would expect games and activities, make them participate, give away prizes and establish camaraderie between them. Based from my experience, it is particularly important to be strict with your invitations. If you have time, you can talk to your invites personally and let them know about the capacity of your budget for the party. Ask them to inform you in advance if they will be bringing a plus one. No one wants a gate crasher. Not only will it ruin your plan but it will also disrupt the ambiance of your party. It should be a time for you and your family and friends to get out of your busy lives and enjoy each other. I am a professional caterer so I am very familiar with hosting dinner parties. I usually plan 2-3 weeks ahead so I require clients to book at least 3 weeks prior to the event. Invitations were done according to client’s taste. These should be given out as early as 2 weeks before the party. Dinner can be served buffet-style or set. Set menus are usually served with minimum of five courses: soup, salad, appetizer, entree and dessert. When serving buffet-style, you can have 2-3 selections for each course. Make sure that the dishes compliment each other, from soup to the dessert. Drinks can be served by the waiters or you can install a bar, where the guests can order any drink they want. You can also hire a lounge singer for entertainment. Guests must be assigned with their respective tables. That way, the party will not look disorganized and the hosts can lead the guests swiftly to their seats. A dinner party is one great way to get together with friends and family that we haven’t seen in a while. We can host dinner parties to celebrate something like maybe a birthday or a promotion or when you want to share a good news. Meticulous planning must be done to make sure that the party will be a success and one of the things that we must really looked into is the menu. I believe that the food that will be served can make or break a party. We must take into consideration the diet of our guests. We should offer a variety of food that we think that our guests would like. Like for example what if Aunt Anne is a vegetarian or Uncle Paul just loves barbeque. It is important that we think of our guests preferences. Another thing is that food can be the topic of conversation during the party. If the food is good then definitely people will talk about it and we can be sure that our party is a success. How to impress guests at a dinner party? Since this is a dinner party, your guest would expect a scrumptious well prepared dinner. Most of the guests would come in an empty stomach, ready to splurge. If all else fails, the food must be a blockbuster. You, as a host, don’t want a lot of left-over to throw away, right? You don’t want your guests leaving your house hungry and unsatisfied. Consider your guest’s preferences for food. Are there Muslims attending or do you have friends whose religion forbids them to eat pork? If you do, then you must refrain from preparing pork dishes. The food must be elegantly presented. Try to learn a few simple food art for the food presentation. Served food should not only be delicious to the taste but mouth-watering to look at, too. It doesn’t have to be complicated with too many details. A simple, easy to learn food art would do the trick. The tableware should be set in their proper places. The dinner plate should be placed at the middle with a salad or soup bowl in it. Put the salad fork to the far left followed by the dinner fork then by the dessert fork nearest to the dinner plate. Put the dinner knife to the right of the dinner plate followed by the teaspoon then by the soup spoon. Dessert spoon and cake fork should be directly on top of the dinner plate. The bread plate with the butter knife should be placed at the upper left of the dinner plate. Then put the coffee cup at the top right of the dinner plate followed by the water goblet and the wine glasses. What should I prepare during a dinner party? When planning a dinner party, we should not only think about the foods being serve, but we should also pay attention to the place where the party would be held. It is important to do a house cleaning three to four weeks before the party. We should also decide on which food in the grocery list should be bought. How can we make our dinner party less stressful if we are the host? there are a lot of party catering available around to lessen our worries on preparing the menu. Its also a great idea to buy paper plates and cups to avoid mountains of dirty dishes after the party, in case you cant afford to get a caterer.